Most experts recommend waiting until a missed period to ensure the most accurate pregnancy test results. However, if you are a woman that has ever been through the brutal two week wait, you probably already know that waiting that long is easier said than done. According to experts, it is highly uncommon for any woman to be able to obtain an accurate result on a home pregnancy test any day prior to six days past ovulation. Therefore, women should wait at least that long to test. 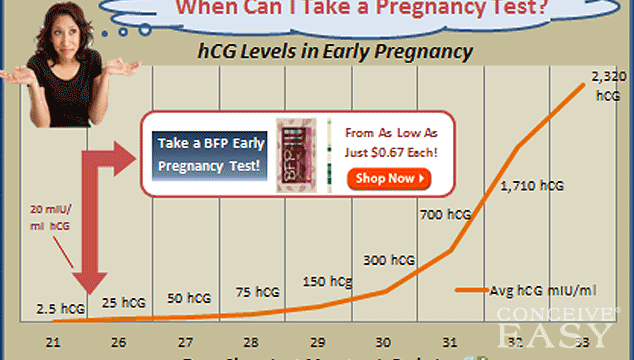 The amount of hCG that is needed for a woman to be considered pregnant is 5mIU/ml. The most sensitive pregnancy tests on the market can detect hCG levels of around 6mIU/ml, so there really is no way to tell if you are pregnant before that. Of course, the optimal time to test is on the first day of a missed period, or later. However, some sensitive pregnancy tests, like the Clearblue Advanced Digital Response Test or the First Response Gold Digital Test can be used as soon as four days before a missed period, or six days before a missed period, respectively. Just keep in mind that the longer you wait to test, the more accurate results you will have. It is possible to take a pregnancy test too early and not have enough hCG in the body to be detected. If you take a pregnancy test too soon, and think that you have gotten a false negative result, wait a few days and test again. If the results still are not what you think they should be, you can always see a doctor and have a blood pregnancy test done to determine whether or not you are pregnant for sure. If you have questions about when to take a pregnancy test, or your results, make sure to consult your doctor for the best results and best advice.